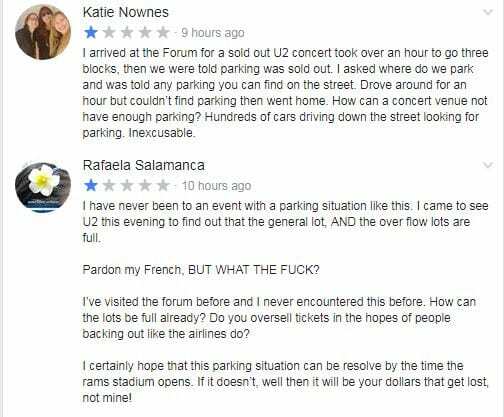 According to posts on social media, fans who paid hundreds of dollars to see the first night of U2’s two-night stand at the Forum in Inglewood sat in traffic for over an hour and then were turned away being told that the parking lots were full. There was some speculation that construction on the new LA Stadium across the street (future home of the NFL Chargers and Rams teams) had occupied a great deal of previously-available space. 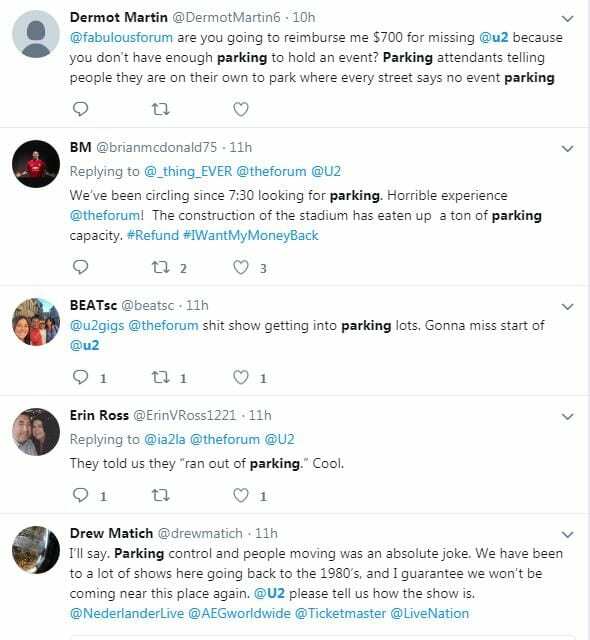 While there’s been a considerable amount of publicity surrounding this tour and it’s use of the Verified Fan system, the dynamic pricing which has resulted in higher grosses with lower turnstile counts, the use of data to generate higher per-caps and more customized experiences, the implementation of an augmented-reality phone app to watch the show with, and a variety of other important-sounding things, it turns out that the current bottleneck preventing the “fan” from having a great “experience” would be the inability of a parking lot operator to direct traffic properly. 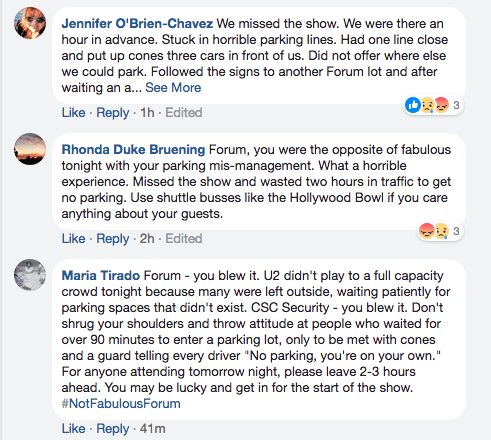 The complaints about the snafu have been widespread among those who took to social media after the fact, many of whom reported they never got into the show. 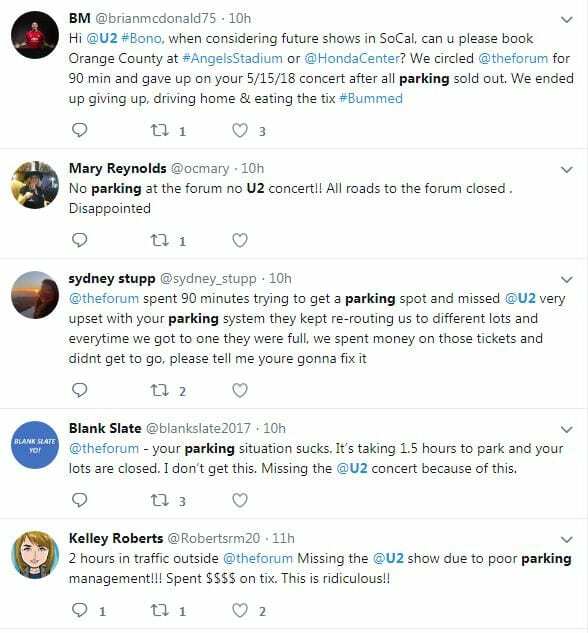 With another show this evening, neither The Forum nor the band (or promoters) have addressed the issues which caused so many to miss the show. 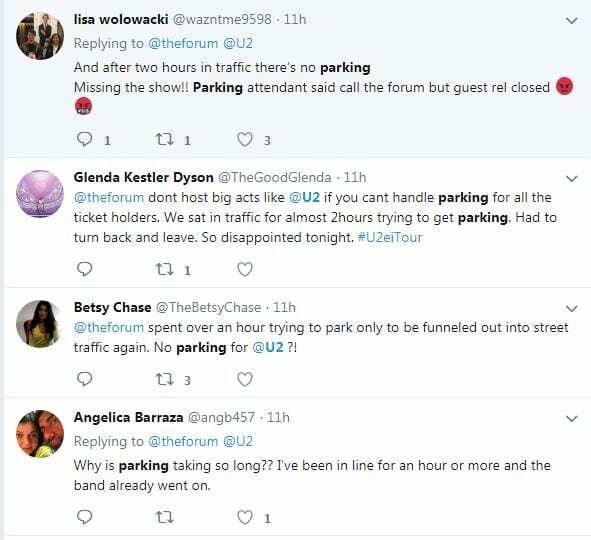 The official @theforum twitter handle instead spent its evening tweeting up close photos and videos of the performance rather than instructing its paying customers how to work through the issues.